Hengst Ragazzo v. Raphael B.
RAGAZZO - the stallion you can't fault! that has received as many as six 10's in his protocol! breeding for as much as $ 2,000,000! RAGAZZO'S progeny are consistently sold at very high prices. sired by Ragazzo, namely Ragman L, Ravelli and Robespierre O'Maine. "Champion of the Future" at the German Stallion Championships. 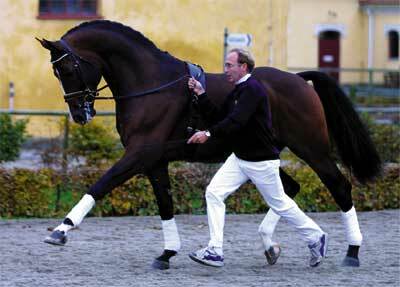 His Sire, Raphael is one of the best known sons of Ramiro Z.
the Dam of Donnerschlag (exp. USA), by Donnerhall. RAGAZZO is simply a magnificent and a true 'ragazzo' ('boy' in Italian). hands down to his superb looking progeny.